Well, I've been posting a lot of pictures of this watch since I got it a few weeks back... but that's what happens when a watch takes over your wrist and your heart. This is a beautifully thought out design - how to simplify a perpetual calendar so that it looks like a time and date only watch at first glance. From top to bottom (and on the sides), this is one heck of a watch. Been wearing this just about every day. Manual wind, with a stated PR of 7 days, and it finally came to a stop yesterday after almost 10 days. This is the corrector for the leap year function. The date is changed via the crown, and there is no month quick corrector. The month is indicated via the short hand, which is a nice way of keeping the dial clean and unclutted. The date can be changed both forward and backward without harm to the movement. There is a lot of ingenious engineering going on inside this watch. You can see that the rear crystal is slightly concave. Aside from the additional difficulty of make it that way, I'm not sure what advantage that provides. The top of my wrist is pretty flat... Moser makes a big deal about this, but from my point of view it is interesting but that's about it. Other clever stuff going on in the movement... the crown is pulled out to the first stop easily, to change the date. That's as far as it goes on the first pull. To change the time, you give it a second pull and it pops out to the second position (while stopping the seconds hand). So you don't have to struggle to find the correct detent and accidentally change the time instead of the date. And the mechanism is buttery smooth - no jostling of the minute hand from pushing in the crown. The beautiful movement. The 1,2,3,black wheel is for the leap year. Don't really need it on the front of the dial. Serial number edited out in photoshop. The Moser seal, the leap year wheel, and the winding gear. The winding has a nice feel, and 10 days worth of winding doesn't take long. Two views of the balance wheel under different lighting conditions to bring out details. The large date is done in an interesting way. Unlike the typical big date with a separate date wheel for the tens and the ones, Moser uses two overlapping date wheels. The upper wheel is for the first half of the month, which has an aperture in it to expose the lower wheel for the second half of the month. This gets a larger display of the date and has the advantage of the single digit dates being perfectly centered in the date window. Clever! The difference in depth wasn't obvious to me - probably due to the "disappearing" factor on the white numbers on a black background. Unfortunately, I didn't find any pictures of this on the interwebs. But this is seriously cool stuff. And some previously posted pictures of the watch. The sculpted sides are a delight to look at. I've been wearing this mostly with casual attire. 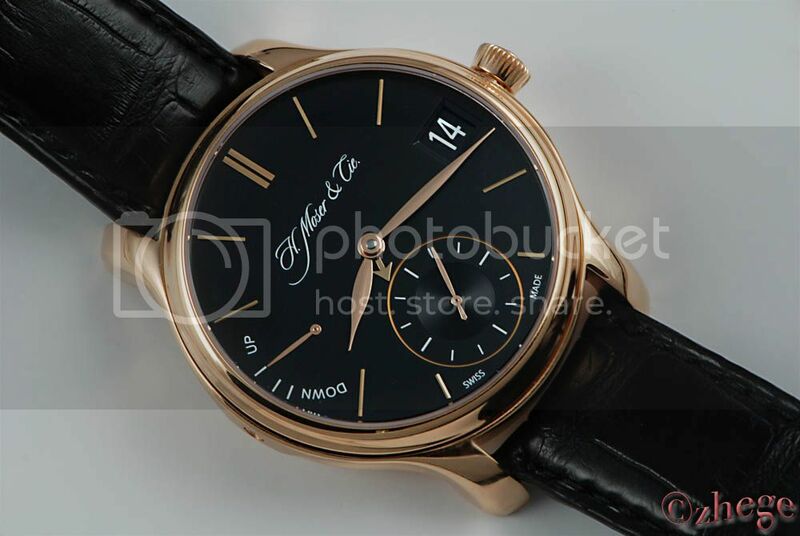 Yeah, it's a nice big ole gold watch but even with the black strap it doesn't look too formal to me. Today it is paired with an untucked grey linen short sleeve shirt and dark blue cargo shorts (my business has a lot of casual days, one advantage of having customers and vendors located all over the globe). Some may say that is tacky... but me and my Moser won't care a bit! But, I don't think I'll go so far as to mount it on a nato strap... there are some limits! Previous Topic: Luminox or G-Shock?